Choose from our 8 varieties of 100% hardwood to have your Mission Coffee Table constructed in. All of our hardwoods are sourced from North America, ensuring that you will be able to enjoy superior quality in every item. The commitment to craftsmanship that our woodworkers have been cultivating for generations adds yet another level of excellence. Once you decide on the wood you would like to have your piece handcrafted in, it is time to pick the stain. Depending on the material selected, you'll be able to see the various options we offer. This is where the fun really starts! Play around with the combinations and imagine the almost endless possibilities for your home. Order free stain samples to confirm your choices. 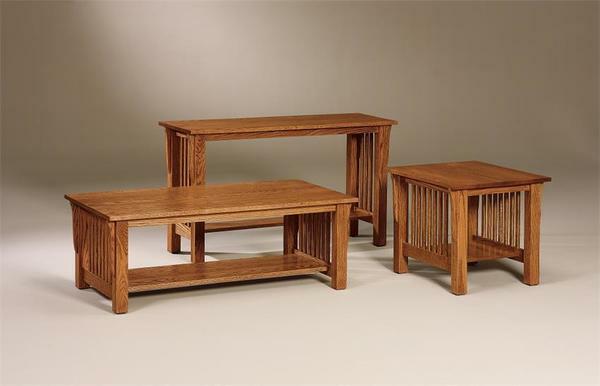 A great way to explore your options is to get in touch with our Amish furniture specialists. They'll be able to get a feel for what you are looking for, curating a collection that you are sure to find a favorite in! Reach us by calling 866-272-6773.